Maney Transport | About Us | Reliably to your destination. Maney Transport –Reliably to your destination. Maney Transport is a reliable and experienced Queensland Carrier specialising in guaranteed next day delivery services along the Western Corridor (the Warrego Highway), as well as providing coverage to the Northern Rivers, Gold Coast and Sunshine Coast regions. Maney Transport has been in the express freight distribution business for over 39 years and has grown to support a fleet of 5 prime movers, 5 single trailers, 25 rigid trucks, 6 vans, and multiple utility vehicles. We pride ourselves on servicing our customers with a variety of delivery options including storage solutions at our warehouse facilities. Maney Transport was founded in 1975 by Tony Maney as the sole owner-driver. Tony previously worked with Mayne Nickless Transport for over 6 years, however he always had a passion to run and build his own distribution company. By 1981 Maney Transport had become a major distributor for National Newspapers. In the late 1980’s the company built a relationship with Riteway Express and McPhee Transport and extended to 7 days a week deliveries across South East Queensland region. While the Newspaper contract is still an ongoing business, Maney Transport quickly expanded into other commodities and into new territories by building strong relationships with local businesses. 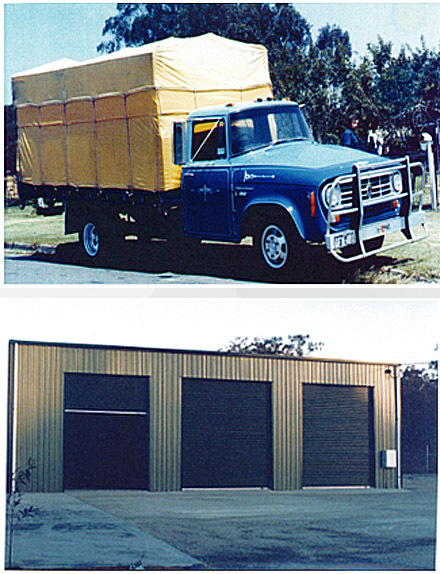 By 1996 we needed to expand our operations and extablished the first Maney Transport Depot in Brisbane. The business grew rapidly in 2011 to 2014 by opening up new opportunities by servicing the major cities along the Western Corridor. This growth has been achieved by continually demonstrating we are a vision led organisation that prides itself on being one of the most trusted carriers in the Queensland Transport Industry. Throughout the years we have continuously supported local communities by providing our services and financial support to the Leukaemia Foundation, St. John’s Parent & Friends Association, Surf Life Saving Clubs, Rotary Club of Roma, Charleville Small Bore Riffle Club, Mustang Brothers RLFC, Trade Day Roma, Bailey’s Trophies, and many other local charities and professional organisations. Maney Transport is constantly adapting to change in the market to meet our customer’s ever-changing requirements. We maintain an intelligent transport system with vehicle tracking and other management system operations. We have evolved into an intrastate logistics group that provides a reliable and trustworthy service that is able to continually adapt to our customer’s needs. All our facilities are protected by the latest security systems, fire safety equiptment and are regularly pest controlled. We are accredited for forklift operation and have sucure pathways for staff members and our customers. Being a reliable and professional transport service provider. The mission of Maney Transport is to meet customer needs and provide a reliable and guarantee service to the complete satisfaction of our customers. We hold ourselves accountable to be professionals at all times. We foster a close team culture and trust and support each other to deliver for our customers. We are fully compliant with the legislation, guidelines, recommendations and internal regulations of our complex and ever changing industry. We take personal responsibility for excellence and quality in everything we do. We treat others the way we expect to be treated and recognize the value of customers, business partners, and fellow team members. NHVR (National Heavy Vehicle Register) Maintenance Management Accreditation Standards Number 540/12938 Expires: 20/07/2017. PPE equipment issued including Hi Vis shirts, long and short sleeves, gloves and eye protection. These are also for Maney Transport to comply with Work Place Health and Safety on site requirements for certain clients. “My first dealings with Maney Transport were in July 2014 during the initial procurement stage of our works in Roma, Queensland, and we have utilised their services consistently ever since. Our civil construction project consisted or earthworks, pipework and large concrete structures meaning a whole array of procurement was required, from large, bulky and oversized items to smaller hand delivered packages. My dealings with Maney Transport have been consistently pleasant and professional: they are well established throughout metropolitan and regional areas so as to always be ready and available to help us out at short notice. On more than one occasion they have come through at the last minute to ensure we have a delivery the next day and we have found their pricing very reasonable for the high quality and dynamic service they offer. “This letter is to outline the service provided to our company over the past two years by Maney Transport. The service provided has been to assist our pipeline company service the principal contractor as required. • Local transport Roma and surrounding districts. • Scheduled deliveries to work sites. In this time I have found the Maney Transport Team to be professional in all aspects of the industry. They have kept to schedules, provide a professional service, give feedback and are extremely reliable. “From the first point of contact with Maney Transport I had sense of professionalism from the manner that they answered the phone regarding my Transport requirements for our business, they understood what I needed and after a brief discussion we arranged to meet with at my office, the day of our meeting was of a very relaxed, with a very open conversation about their own businesses and what they were able to provide and also not able to provide, and to our business that openness and honesty is very important to us with the view of a long term business relationship. It was great to hear a company be honest with anything that was not within their capability in their delivery network, although with that in mind we have consistently talked regularly about how we could expand their network within our business together, nothing is ever to hard with very obliging fleet of drivers that are always willing to help, Maney Transport work together with their customers to provide an outstanding services to ensure that both parties are 100% happy. RE:– your recent generosity towards the Rotary club of Roma. Thank you for ogranising the transportation of a large load of redundant medical equipment to the Rotary Donations in Kind ware hour in Brisbane and also the use of your fork lift and lay down yard. All this quipment is recoditioned and tested by a dedicated group of Rotarians and eventually is hipped off to disasted areas like some of our Pacific neighbours recently affected by cyclones etc. “Your reliable and experienced Queensland Carrier.